Abstract: Background: Various clinical and biochemical parameters have been hypothesized to predict cholesterol gallstone formation. Hence, this study was structured to evaluate the degree of some of these suggested predictors among inhabitants of Port Harcourt in Nigeria.Methods: This was a retrospective study of the clinical and biochemical parameters of 42 cholesterol gallstones formers within a tertiary hospital in Nigeria. Records of age, gender, weight, height, calculated body mass index and plasma biochemical parameters (total cholesterol, total bilirubin, and total calcium) of cholesterol gallstone formers from 1st January 2008 to 31st December 2017 were abstracted from medical and laboratory records and analysed using SPSS version 20.Results: There were more females (70%) than males (30%) with a ratio of 2.3:1. The age ranged from 31-64 with mean 46.78±9.33. Obesity was observed among 40.5% of study population. Female gender (OR = 2.823; 95% CI = 2.446-3.200; p<0.001), obesity BMI status (OR = 1.534; 95% CI = 1.436 - 1.632; p = 0.012) and abnormal plasma cholesterol status (OR = 3.011; 95% CI = 2.916 - 3.106; p<0.001) were significant predictors of cholesterol gallstone formation. Abnormal plasma cholesterol status was the strongest of the predictors with AUC of 0.920 (p<0.001), seconded by female gender (AUC = 0.889; p<0.001) and obesity BMI status (AUC = 0.834; p<0.001).Conclusions: Abnormal plasma cholesterol status is the strongest independent predictor of cholesterol gallstone formation, seconded by female gender and high BMI status, among inhabitants of Port Harcourt in Nigeria. Abstract: Background: Forced expiratory volume in 1 second (FEV1) to forced vital capacity ratio (FVC) is being used to diagnose the obstructive lung diseases. Forced manoeuvre (FVC) or relaxed/slow manoeuvre (SVC) can be used to determine vital capacity (VC). In healthy individuals the difference between SVC and FVC (SVC-FVC) is minimal whereas in the presence of airway obstruction this difference will become significant. The present study was done with the objective to detect and compare the airway obstruction by determining the FEV1/FVC and FEV1/ SVC ratios.Methods: This was a prospective cross-sectional study done at OPD, Government Thiruvoteeswarar hospital of thoracic medicine/Kilpauk medical college during the period from September 2016 to February 2017among the patients presenting with symptoms of obstructive airway disease. The sample comprised of 353 patients who underwent spirometry according to standard of ATS/ERS guidelines. As per the criteria, the patients are classified into four groups, by spirometry.Results: The analysis of FEV1/FVC revealed the presence of airway obstruction in 131 (37%) individuals compared to 165 (46%) individuals by the analysis of Fev1/SVC ratio. In the obstruction and mixed groups, the difference in vital capacity SVC – FVC is statistically superior (p<0.05) when compared to normal and restriction groups.Conclusions: The FEV1/SVC ratio detected the presence of airway obstruction in more individuals than did FEV1/FVC ratio and hence FEV1/SVC considered as more reliable factor in the detection of obstructive airway diseases. Authors: Minali Raja, Tanvi . Abstract: Background: Early diagnosis of tuberculosis (TB) by different clinical methods plays a major role in control of TB in early stages. The present study was done with the aim to assess and compare the efficiency of staining techniques and polymerase chain reaction (PCR) for detection of tubercle bacilli in various organs.Methods: The study included data 14,472 patients of both prospective (during March 2008 to 2009) and retrospective cases (past one year of the study period). For prospective cases the cytological material for the study was collected by fine needle aspiration cytology (FNAC). For retrospective cases of past one year were retrieved from the records. TB suspected cases were evaluated by Ziel-Nelson (ZN), Auramine-Rhodamine (A-R) staining techniques and by PCR.Results: Total 284 cases were diagnosed with TB in various organs. In them, epithelioid granuloma was seen 227 cases (79.92%) and Langhans giant cells were seen in 18 cases (6.34%). AFB positivity on ZN staining was observed in 161 cases (56.69%) and 9 cases (3.16%) showed positivity for tubercle bacilli on A-R staining. PCR was done in 20 prospective cases and total percentage of positivity by PCR was seen in 18 cases (90%).Conclusions: The total percentage positivity for detection of tubercule bacilli by PCR assay was found to be more (90%) with high sensitivity and specificity compared to ZN (56.6%) and AR staining techniques (3.16%). Abstract: Background: Hypertension control is essential to prevent macro vascular complications in patients with chronic kidney disease. Ambulatory Blood Pressure Monitoring (ABPM) is the recognized gold standard for the assessment of hypertension and hence in this study ABPM assessment was done in 50 patients with dialysis dependant CKD to evaluate the adequacy of BP control and prevent adverse events.Methods: This study is a prospective observational study conducted at Aarupadai Veedu Medical College and Hospital, Pondicherry among hypertensive patients with dialysis dependant CKD patients as per standard criteria. A total of 50 patients participated in this study of both gender after obtaining written consent. Patients with coronary artery disease, diabetes mellitus, acute kidney injury were excluded from this study.Results: Out of the total 50 patients included in this study 72% had early morning dipping in BP and remaining 28% had non-dipping in systolic and diastolic pressure. The mean systolic pressure reached a maximum of 160.95mmHg to a minimum of 113.38mmHg and the mean diastolic pressure with a maximum of 98.47 to a minimum of 62.71mmHg on an overall 24 hours ABPM monitoring. The mean systolic and diastolic pressure was found to be more in the active period than in the passive period.Conclusions: Nocturnal BP is superior to day time BP in predicting CVD outcomes. This study shows both systolic and diastolic pressure variability over 24hrs maximum during night hours (nocturnal hypertension) and non-dipping of early morning BP. Both non-dipping status and nocturnal hypertension are associated with target organ damage and CV risk. Abstract: Background: Disaster causes widespread destruction, disrupting people’s lives and causing human suffering with communities finding it difficult to cope. When the disaster occurs, human beings may not have the power to stop it from occurring, nevertheless they may have the power and ability to adapt or minimize the impact of the disaster on their lives. 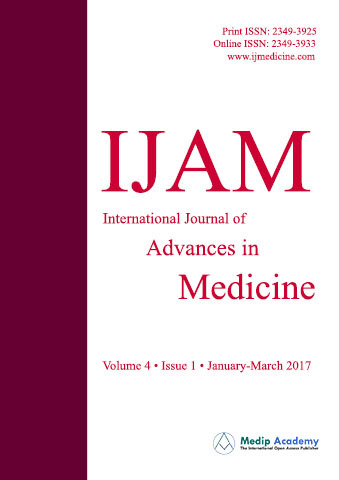 This study was aimed to assess the level of knowledge and awareness on disaster management among medical professionals.Methods: A cross-sectional study was conducted among the medical professionals from two selected medical college hospitals in Dhaka city of Bangladesh from January to April 2017. A total of 120 samples were selected purposively using two stages sampling technique. The data was collected using self-administered semi-structured questionnaire and was analysed using SPSS 20.0 version.Results: In this study half 60 (50.0%) of the study participants were in the age group 20-30 years and about 77.5% of the study participants were Muslims. About 64.2% of the study participants had less than 11 years of professional experience. Only 10 (8.3%) of the study participants had attended training on disaster management. About 30.0% of the study participants had good level of knowledge and only 49.2% had high level of awareness.Conclusions: The findings revealed that most of the study participants had not attended any training on disaster management. It also reported that the majority of the study participants had poor level of knowledge. Evacuation exercises need to be done for the entire hospital at least twice a year. Abstract: Background: Magnesium is the fourth abundant cation in the human body and second most abundant intracellular cation after potassium and also serving as cofactor in more than 300 enzymatic reactions. Magnesium deficiency is the most commonly overlooked condition in critically ill patients and associated with other coexisting electrolyte abnormalities. The aim of the present study was to evaluate serum magnesium levels in critically ill patients and to correlate with patient outcome and other parameters like length of stay in ICU, ventilator support, APACHE-II score and duration and mortality.Methods: A two years observational study after ethical committee approval was conducted at a tertiary care hospital among critically ill patients admitted in ICU. Serum magnesium levels and other relevant investigations were performed within 24 hours of admission. Patients management and progress were followed till the outcome. The data was analysed by using SPSS software version 16.0 for windows.Results: Total of 150 patients with 102 males and 48 females were enrolled. 97 cases (64.7%) of hypomagnesemia were observed and 11 cases of hypermagnesemia and 42 cases with normal serum magnesium levels were observed. Hypomagnesemia cases were compared with normal cases and found that: Hypomagnesemia cases had higher mortality rate, higher APACHE II score, more length of hospital stay and ventilator duration. Significant association was identified with diabetes and chronic alcoholism (p valve <0.05).Conclusions: Monitoring of magnesium levels in critically ill patients has several prognostic and therapeutic implications and should be recommended as a regular parameter as it is commonly out looked condition. Statistically significant association of hypomagnesaemia was found with hypocalcaemia, hypoalbuminaemia, septicaemia, diabetes and chronic alcoholism. Higher APACHE II score is associated with higher mortality and more length of stay in ICU among the cases of hypomagnesaemia. Abstract: Background: Magnetic Resonance Imaging (MRI) is a well-established imaging technique, which are available at most larger hospitals today. Due to the combination of this high contrast and the fact that it is a non-ionizing radiation, MRI is often used for investigation of a large range of pathologies in almost all parts of the body. This study was performed to describe the MRI features in various types of lesions causing painful hip joint, as well as identify the common lesions seen in painful hip joint and to analyse the severity and extent of the underlying lesion in various conditions of hip joint pain, and early detection of pathological changes helpful to prognosticate and influence therapeutic decisions.Methods: This descriptive study was done on 50 patients with complaints of hip joint pain were included into the study. Appropriate MRI sequences and multi-planar imaging performed for every patient.Results: Out of the 50 patients included in the study, 74% of them were males who were predominantly affected with hip pain. The most common age group which was affected was 51-60 years (20%) and 21-30 years (20%). The most common pathology amongst the patients was Avascular necrosis of femoral head seen in 44% of the patients, osteoarthritis was seen in 54 patients, Tuberculosis in 5 patients, 2 had Perthe’s disease, joint effusion was observed in 6 patients.Conclusions: MRI of the hip joint is an informative, diagnostic, non-invasive, rapid and accurate imaging modality for the assessment of hip pain and sufficient imaging modality for delineation of different hip joint pathology. Authors: Katta Subraya Prakash Rao, Saladi Mahesh, Ramachandra Bhat C.
Abstract: Background: Hypertension is one of the known cardiovascular risk factors. Several epidemiological studies have found an association between various anthropometric indicators and hypertension. The present study was conducted to investigate the relationship between different commonly and uncommonly used anthropometric parameters, various biochemical parameters and hypertension in adults.Methods: A hospital based cross sectional study conducted among 300 adults aged 40 years and more, attending Medicine OPD of a tertiary care institution after obtaining their consent and permission from institutional ethical committee. Anthropometric measurements, blood pressure examination and relevant laboratory investigations were done.Results: Hypertension was seen in both obese and non-obese study subjects. BMI, waist circumference, neck circumference, sagittal abdominal diameter and CRP was higher in hypertensive males than normotensives and it was statistically significant. BMI, waist circumference, hip circumference, neck circumference, sagittal abdominal diameter and CRP had a positive correlation with systolic and diastolic blood pressure and it was found to be statistically significant.Conclusions: CRP, serum ferritin, sagittal abdominal diameter, hip circumference, waist circumference and neck circumference showed a positive correlation with both systolic and diastolic blood pressure, which means that WC and SAD can be used to get information about visceral obesity in an individual. This also suggests that decrease in intra-abdominal fat could decrease the blood pressure. Abstract: Background: Mucormycosis is a rare opportunistic fungal infection typically affecting diabetic or immunosuppressed patients. In most of the cases, infection is caused by inhalation of fungal spores. The aim of the study is to assess the different modes of presentation, risk factors management and prognosis of patients with mucormycosis.Methods: It is a retrospective study conducted in Father Muller medical college hospital between January 2016 to October 2017 and included all patients hospitalized for mucormycosis confirmed by mycological and /or histological findings. This study was approved by the institutional research and ethics committee. All case records were identified from in patient MRD with the diagnosis of mucormycosis over the last one year. For each case taken, the clinical information was recorded from case sheetResults: Out of the 7 cases studied 5 (71.4%) had rhinoorbital involvement 28.6% had pulmonary involvement with hemoptysis being the primary symptom. The mean age of the affected population was 55.7 years. Uncontrolled diabetes mellitus was the most common predisposing factor as seen in 71.4% cases with mean Hba1c levels 13. The mean ESR in present study was 79. There was increased WBC count in all the cases studied with neutrophilic predominance. Urine ketones was positive (++) in all the cases of diabetes with rhinoorbital involvement.Conclusions: Uncontrolled diabetes mellitus is a predisposing factor for mucormycosis. Elevated ESR was noted in all the cases. Abstract: Background: According to Karnataka state HIV statistics, HIV positivity among general clients tested at ICTCs, Raichur (4.9%) had third highest proportion of HIV positive cases. Authors decided to focus on opportunistic infections (OIs) in HIV patients of Raichur district since they contribute to the mortality and morbidity.Methods: It’s a cross sectional, hospital-based study with 100 patients with HIV infections as per NACO guidelines with features of OIs were included in study.Results: In this study, 77 males (77%), 23 female (23%) patients with 58% (n=58) of them in 30-39yrs age group and 21% (n=21) in 20-29yrs were seen. Majority of cases were laborers (47%) and less educated (n=55). Symptoms included loss of appetite (76%) n=76, fever (72%) n=72, cough (55%) n=55 and diarrhoea15% (n=15). The respiratory system was most frequently involved by opportunistic infections and accounted for 56% (n=56) of the total cases and clinically consolidation/crepitation was most frequent presentation accounting for 75% (n=42). Tuberculosis was most common OI (55%) with combined pulmonary and extra pulmonary in 56.37% (n=31), tubercular meningitis and tubercular lymphadenopathy each accounting for 30.77% (n=12) amounted majority, with pleural effusion 20.52% (n=8). Median CD4+T cell count was 217.72 in TB. Candidiasis is second most common OI with 49% (n=49), median CD4 count being 190.07. Other OIs observed were pneumocystosis 16% (n=16), cryptococcosis 2% (n=2).Conclusions: Most common OI in the study was tuberculosis (in extra pulmonary TB meningitis and TB lymphadenitis) followed by Candidiasis, Pneumocystosis and Cryptococcosis. Abstract: Background: Snakes are poikilothermic carnivorous reptiles that have evolved the venomous apparatus for the purpose of procurement of food. Snake bite can result in local and systemic complications. Major systemic complications include acute renal failure, neurologic abnormalities requiring ventilator support and disseminated intravascular coagulation. Disseminated intravascular coagulation can result in serious life-threatening systemic complications like haemorrhage, infarction and even death if the treatment is delayed. The present study was undertaken to study the clinical profile of the snake bite patients who develop coagulopathy and to study the role of coagulation markers to evaluate the morbidity and mortality of snake bite victims.Methods: Hundred patients consecutively admitted with history of snakebite were studied. Patients who have developed local signs of envenomation due to snake bite were included in the study group. The coagulation profile was assessed by doing blood investigations.Results: In this study, patients who developed coagulopathy had prolonged hospital stay and requirement of more blood products transfusion causing increased morbidity. 43 patients (35.8%) had platelets less than 1 lakh and approximately hospitalized for 26 days sand INR was more than 1.5 in 112 patients (93.3%) and hospitalized for 22 days and they received fresh frozen plasma. The survival rate in this study was 86% followed by 13.3% deaths.Conclusions: Use of clinical and laboratory parameter evaluation needed to identify the coagulopathy very early to reduce the hospital stay and mortality. Authors: Prabhu S., Prashanth V. N.
Abstract: Background: Malaria is fast emerging as a number one infectious disease with high morbidity and mortality across the globe. It’s being transmitted across 108 countries containing 3 billion populations (40% of world’s populations) with more than 3 million deaths per year. India is an endemic country for malaria with an estimated 70-100 million1 cases per year. 45-50% of them are due to Plasmodium falciparum (Pf). Pf is responsible for majority of severe and fatal malaria though death due to Plasmodium vivax mono infection have also been reported. Symptoms and sign are highly non-specific in malaria making it more of a clinical diagnosis more than a laboratory diagnosis. Presentation may vary at times and can be quite confusing as malaria is a multisystem disease. Authors ’ idea was to study the variable manifestations in confirmed cases of malaria patients at our hospitalMethods: A hospital based cross sectional study was conducted for a period of one year-from 01-08-2015 to 31-07-2016 based on authors’ hospitals records (case sheets with demography profile, clinical features, investigations and treatment outcome).Results: A total of 369 patients positive for malaria parasite were included in the study. 369 were smear positive-219 positive for Plasmodium vivax, 127 were P. falciparum type and 23 were for both. Majority were males (64.50%) and belonged to the age group of 21-50 years (58.84%). They were admitted in post monsoon months (60.43%). Of them 46.44% had classical symptoms of malaria. All the patients had received mainly artemisinin combination therapy (ACT) and 91.87% patients recovered in 7-28 days. The mortality rate was nearly 5.69%.Conclusions: The present study was useful to know the varied manifestations of malaria and hence will be useful in making a clinical diagnosis of malaria. Abstract: Background: Insulin and thyroid being intimately involved in cellular metabolism, excess or deficit of one of these hormones leads to abnormality of the other. Association between type 1diabetes and hypothyroidism may be autoimmune. Association of poorly controlled diabetes and thyroid results in a low T3 state and loss of TSH response to TRH. The objective of the present endeavor is to study the thyroid functions in diabetics and to know the spectrum of thyroid dysfunction in DM.Methods: It is a prospective cross-sectional study of 100 diabetic patients admitted in medical wards in a duration of 6 months from November 2017 to May 2018 of both sexes in between age group of 30-80years. All these patients underwent thyroid profile tests. Detailed history and examination done on these patients.Results: Out of total 100 patients included in the study, thyroid disorder was present in 29%. Hypothyroidism in 1 patient, sub clinical hypothyroidism in 15 patients, hyperthyroidism was present in 13 patients. Females (36%) had high incidence than males (22%). Elderly people had higher incidence of subclinical hypothyroidism (18.2%), clinical features of hyperthyroidism present in 8 patients, Poor hypoglycemic control seen in hyperthyroid individuals (55.5%). Duration of diabetes had no relation with incidence of thyroid disorders.Conclusions: Prevalence of thyroid disorders in diabetic patients was 29%. Elderly population had more incidence. Subclinical hypothyroidism more common than other conditions. It was more common in females than in males. There is no relation in between duration of diabetes and thyroid disorder. Severe complications were noted in patients with sub clinical hypothyroidism. Abstract: Background: Fatty liver is a common clinical condition seen in medical wards. It can be either alcoholic fatty liver disease or non-alcoholic fatty liver disease. It is an iceberg phenomenon which can be associated with metabolic syndrome, cardiovascular disease and hepatocellular carcinoma. The aim of the present study is to observe and analyse the prevalence of fatty liver diseases in general population admitted to general wards in department of general medicine and to help in the timely prevention of associated risk factors and complicationsMethods: It is a prospective cross-sectional study conducted in Narayana medical college and hospital a tertiary care hospital for a period of 6 months from November 2017 to May 2018 and includes a total of 250 patients. Patients were routinely screened with ultrasound abdomen and those having fatty liver changes were included in this study and their clinical and biochemical parameters were examined.Results: Out of the 250 patients admitted to medical wards during the study period, 70 patients (28%) had fatty liver. Out of these, 23 (34%) were males and 47 (67%) were females, alcoholics were 9 (12.8%) and non-alcoholics were (87.2%), 35 (50%) were diabetics, 11 (15.7%) had CAD (coronary artery disease), 29 (41.4%) were obese with BMI >30 and 26 (37.1%) were hypertensive.Conclusions: Fatty liver is a common incidental finding in ultrasound abdomen in patients admitted to medical wards and when neglected, which when given importance and with proper intervention and life style modifications can prevent metabolic syndrome, cardiovascular disease and hepatocellular carcinoma. Abstract: Background: Current statistics show that 36.9 million (31.1-43.9 million) people were living with HIV globally at the end of 2017. 15-73% of people with HIV may develop neurological disorders with sometimes as a presenting illness. The aim of present study is to document the various neurological manifestations and presentations with relation to CD4 counts among the HIV/AIDS cases attending a tertiary care hospital of south India.Methods: A prospective study was conducted for two years at a tertiary care hospital among confirmed cases of HIV and the neurological manifestations were diagnosed and clinical signs and symptoms were noted. CD4 counts of all the cases were performed by FACS counter and Neuroimaging study was performed on necessary cases.Results: Total of 125 cases with 69.6% males and 30.4% females were enrolled. Mean age of cases was 35.14±3.8years. 86.4% were positive for HIV-1 type. Headache was the most common ailment (78.4%). Meningeal enhancement observed in 24.5% followed in order by ring enhancing lesion (18.37%), cerebral atrophy and infarction (12.24%). Tubercular meningitis was the commonest type (33.6%). In 12 cases of cryptococcal meningitis the CD4 counts were <100 cells/mm3.Conclusions: To conclude in present study, secondary neurological manifestations were more common than primary manifestations in present study. Tubercular meningitis being the most common and CD4 counts <100cells/mm3 were associated with cryptococcal meningitis. Cases with CD4 counts less than 100cells/mm3 had poor prognosis. Authors: Lokesh S., Shivaswamy S.
Abstract: Background: In the recent years diabetes mellitus (DM) has emerged as a major public health problem worldwide with potential to develop vascular and neuropathic complications. HbA1c has got an important role in monitoring the treatment and risk of developing micro and macrovascular complications. Present study is done to determine the prevalence of diabetic retinopathy (DR) in association with raise in HbA1c and also to correlate the severity of Diabetic retinopathy with the levels of HbA1c.Methods: In this descriptive observational study 50 diabetes mellitus patients with visual disturbances who attended the Department of General medicine and Department of Ophthalmology between January 2012 to December 2012 at Vydehi institute of medical sciences and research centre are selected. All the patients were subjected to the relevant investigations along with dilated retinal examination and slit lamp examination. The results were tabulated according to the severity of retinopathy and other clinical variables.Results: In this study majority of the patient were in the age group of 61-70 years and 68% were male patients. Mean duration of diabetes mellitus was 9.8±5.34 years. Also 54% of them had coexisting hypertension. Present study showed the presence of diabetic retinopathy in 64% of patients, out of which 24% of them had mild DR and 14% had moderate DR.Conclusions: Present study showed as the HbA1c level increases severity of the diabetic retinopathy also increases. And also, patients who had microalbuminuria and longer the duration of diabetes higher the chances of microvascular complications. Hence HbA1c can be used as a useful tool to assess the long-term control of diabetes mellitus and hence the development of diabetic retinopathy. Abstract: Background: Stroke is a clinical syndrome, which describes a sudden neurological deficit of presumed vascular origin. The risk factors for stroke are diabetes mellitus, smoking, alcohol and hypertension. Colour doppler ultrasound is one of the important tool for the evaluation of exracranial insufficiency of the carotid arteries. This study was performed to assess the carotid arteries with the help of color doppler in carotid artery disease.Methods: Of the 100 patients who had come to our department during the study period with symptoms of cerebrovascular disease such as transient episodes of neurological dysfunction, sudden weakness or numbness, hemiparesis, focal neurological deficits, sudden loss of consciousness, altered sensorium, aphasia, slurring of speech, diminution or loss of vision were included into the study. CT scan of brain and color doppler evaluation for the extracranial carotid arteries was done for all the patients to assess the atheromatous disease of extracranial carotid arteries and comparison with brain changes in cerebrovascular disease patients.Results: Of the 100 patients included into the study, 51% were males and 49% were females. 59% of the patients were above 61 years of age, 24% of them were between 51-60 years and 12% were between 41-50 years. 82% of the patients had the presence of atherosclerotic plaque while 18% had increased intima-media thickness without the plaque. Among the patients with atherosclerotic plaque, 63.4% had diabetes and 68.3% had hypertension. <50% stenosis was seen among 45.1% of the patients while 36.6% had between 50-70%. Near total occlusion was seen in 6.1% of the patients.Conclusions: The color Doppler sonography is a useful tool in evaluation of extra cranial course of carotid vessels. It is a non-invasive, cheap, faster modality without any side effects. Therefore, it could be used in predicting CVA in patients with carotid atheromatous disease. Abstract: Background: Knee injuries related to organised sports and physical training related activities are a major component of injuries sustained by armed forces personnel. Knee instability caused by meniscal and ligamentous injuries cause varying degree of disabilities to the trained soldier and have a serious implication on the battle preparedness of the armed forces. MRI of the knee being a non-invasive modality is being increasingly used in pre and post op evaluation of patients in such cases.Methods: A prospective observational study comprising of 161 patients of knee injuries sustained due to sports and physical training related activities was carried out. MRI and arthroscopic examination of the knee was done, and various statistical tests were performed to evaluate the accuracy of MRI in comparison to arthroscopy.Results: ACL tears were seen in 122 patients (75.5%), PCL tears were seen in 67 patients (41.6%), while medial and lateral meniscus tears were noted in 93 (57.7%) and 50 (31%) patients respectively. The sensitivity and specificity of MRI in detecting ACL tear, PCL tear and medial meniscus injury ranged from 84% - 90.5% and for lateral meniscus it was 72.92% to 86.73 %. The accuracy of MRI in detecting the tear of ACL, PCL and menisci ranged from 82.61% to 89.97%.Conclusions: The accuracy of MRI in detection of meniscal and ACL tears is very high. Pre-operative MRI in conjunction with adequate history and physical examination can help the clinician to make an accurate diagnosis and can help reduce unnecessary arthrosopic surgeries. Abstract: Background: Gallstone disease is a significant health problem world over (in both developing and developed nations). The incidence of gallstone disease increases after age of 40years and it becomes 4-10 times more common in old age. As many as 16% and 29% of women above the age of 40-49 years and 50-59 years, respectively, had gall stones. Laparoscopic cholecystectomy introduced in 1985 has become the procedure of choice for surgical removal of the gallbladder. The aim is to compare laparoscopic cholecystectomy and open cholecystectomy in patients of cholelithiasis by measuring parameters such as use of post-operative analgesia, operative time, post-operative hospital stays, morbidity, mortality and patient satisfaction.Methods: It is a prospective randomized study of 120 patients of cholelithiasis aged between 20years to 80years operated during 2015-2018 at of Anugrah Narayan Magadh Medical College and Hospital, Gaya, Bihar, India. They were divided into open and laparoscopic Cholecystectomy groups by drawing a lottery.Results: The median (range) operation time for laparoscopic cholecystectomy was 55-155 min (mean=102 min) and 40-105 min (mean=72 min) for open cholecystectomy (p <0.001). Form LC group 5 cases had to be converted to OC. Rate of conversion was 5/60=8.3% which is within limits of worldwide laparoscopic cholecystectomy conversion rate of 5% to 10%. LC was found to be superior to OC.Conclusions: Laparoscopic cholecystectomy is better than open cholecystectomy However, open cholecystectomy is preferable in cases of complicated cholecystectomy. Abstract: Background: Cardiovascular disease is one of the most common causes of mortality in developed countries, as well as in the whole world. In this regard, autologous transfusion is a topic that can be useful and valuable, especially in complex surgery such as heart surgery and organ transplantation. One of its variants is Acute Normovolomic Hemodilution (ANH). Therefore, the aim of this study was to compare the effect of ANH on the amount of bleeding in the first 48hours after coronary artery bypass grafting.Methods: In this clinical trial, 100 patients were selected from all heart patients referred to Imam Khomeini Hospital in Ardebil for CABG surgery in the years 2016-17. They were selected by simple random sampling as a statistical sample and They were divided into intervention (50 ANH recipients’ people) and control groups (50 without ANH people).Results: Based on the findings, in the ANH recipients’ group, the mean of bleeding volume was 59.1±7.3ml in the first day and 55.6±4.2ml in the control group and the difference between the two groups was not significant on the first day. The mean of bleeding volume on the second day was 46.1±2.8ml in the ANH group and 42.7±2.9ml in the control group. Although it was somewhat higher, it was not statistically significant. Of all samples 45% were female and 55% were male. The most common type of blood group was 33 (33%) in the blood group O. The highest age group (61%) was over the 60 years old. The pump time varied with an average of 122.2±21.5minutes. The lowest value was PT 11 and the highest was 15 with an average of 13.02±0.9seconds. The mean of PTT was 32.5±2.6seconds and the mean INR was 1.1±1.0. The average plt was 251170±64124. The mean ACT was 596 / 6±183/7seconds.Conclusions: The results showed that in the mean of bleeding volume between the intervention and control groups (p = 0.41), bleeding volume by age (p = 0.3), bleeding volume by gender (p =0.54) and bleeding volume by blood group (p=0.48) was not significant difference. Based on these results, it is suggested that more studies be done on the more number of samples. Abstract: Background: Though anemia due to iron deficiency is quite common in India there has been little wok done on the incidence of etiopathogenesis of severe anemia without apparent cause. Anemia is prevalent throughout the world. The objective of the present endeavour was to study the prevalence of severe anemia, to form an etiological categorization of anemia and to study the prevalence of heart failure in the study groupMethods: Total of 50 patients admitted to the medical ward of MediCiti Institute of Medical Sciences and meeting all the exclusion and inclusion criterion were studied. All the patients were subjected to a detailed history and physical examination. All cases were examined in detail according to proforma, investigations, pathological examination and other special tests were carried out.Results: Female preponderance in a ratio of 3:2 was seen. Nutritional anemia was the most common etiology and all cases were seen only in females. Fatigue and tiredness were reported by all patients, hepatomegaly was the most in 42% of the patients. 38 (76%) were found to have cardiac murmurs. As the hemoglobin increased the proportion of patients with heart failure reduced. But this trend was not found to be statistically significant. The association between Hb level and presence of hepatomegaly or splenomegaly was not found to be statistically significant. Thrombocytopenia was the most common cytopenia found in 34%. Only 16% of the patients with severe anemia were found to have normocytic normochromic picture.Conclusions: Severe anemia was found to be associated with morbidity. Hence early detection and prevention by vigorous treatment is important. Authors: Vijayalakshmi Chikkamath, Arathi Darshan, Jayaprakash S. Appajigol, Naveen Angadi, Abhishek T. G.
Abstract: Background: Diabetes increases the morbidity and mortality due to its propensity to develop micro and macrovascular complications. Recently the role of haemostatic factors, particularly fibrinogen, in atherosclerosis and its complications has invited considerable attention. The present study was conducted to study plasma fibrinogen levels in type II diabetes mellitus patients with microvascular complications.Methods: One hundred patients aged 18years to 60years with type 2 diabetes mellitus with microvascular complications were included in the study. HBA1c, plasma fibrinogen, urine routine examination, fundoscopy, monofilament testing, FBS, PPBS were done. Descriptive statistics was used to analyse data.Results: Out of 100 diabetes patients with microvascular complication studies, 88 patients were found to have hyperfibrinogenaemia. Out of 100 patients 67 patients had HbA1c of more than 8%, and all of them had elevated fibrinogen levels (p <0.0001). The prevalence of hyperfibrinogenemia was higher in patients with diabetic retinopathy (90%), when compared to those without diabetic retinopathy (83.33%) although it was statistically not significant (p=0.266).Conclusions: Hyperfibrinogenemia among type 2 diabetes mellitus patients with microvascular complications was high. Glycaemic control has a significant impact on the fibrinogen levels. Longer the duration of diabetes, there was a higher prevalence of hyperfibrinogenemia. Abstract: Background: Cardiovascular diseases are the most common diagnosis in the elderly, and the first cause of death in men and women over 60 years. It is not clear if the risk factors of acute myocardial infarction (AMI) are different in elderly and non-elderly people. The aim of this study was to compare the prevalence of risk factors of acute myocardial infarction between elderly and non-elderly patients who had been admitted to hospital for the first attack of acute myocardial infarction (AMI).Methods: A retrospective study was done in Narayan Medical College and Hospital, Jamuhar, Sasaram, Bihar from January 2017 to December 2017. Study population were all patients who were admitted due to AMI in medicine ward. Patients were selected as per World Health Organization guidelines. The patients were divided into two groups, non-elderly patients of <60 years and elderly patients of ≥60 years.Results: Among different risk factors, diabetes and hypertension were more common in elderly than their non-elderly counterparts, and male gender, smoking and family history of ischemic heart disease was more common in non-elderly patients than elderly ones.Conclusions: This study provide vital information on young AMI patients amongst the diverse population of north India and will help to guide the treating physicians and the health care system to adopt appropriate steps directed towards primary and secondary prevention of AMI in young patients of this region, especially smoking cessation, which is the commonest modifiable risk factor, in their most productive years of life. Authors: Jayanthi N., Abhilash Kasibhatla V. S. S. R., Shankar R.
Abstract: Background: The protective effect of bilirubin relates to the antioxidant property of bilirubin, which prevents lipid oxidation, especially low-density lipoprotein (LDL), and inhibits free radical-induced dam-ages. Lower serum bilirubin level has been proven to be associated with endothelium and microvascular malfunction. The aim of the present study was to assess the association between serum bilirubin levels and coronary artery disease in comparison with controls without coronary artery disease.Methods: A cross-sectional study was conducted for a period of a one year in our medical college hospital. Patients with evidence of coronary artery disease for not more than 10 years of duration confirmed by ECG, ECHO and other previous case records were taken as cases. Controls were selected matched with age, gender and other co-morbid conditions. Total of 200 subjects were included in the study with 100 cases and 100 controls. General and systemic examination was conducted on all study subjects including laboratory investigations like complete blood count, renal function test, lipid profile, viral markers such as HBsAG, HCVIgM and liver function test which includes total bilirubin, direct and indirect, liver enzymes, albumin and globulin levels. A 12 lead ECG and a transthoracic echocardiogram was performed for all patients.Results: The various liver function test parameters were compared between the cases and controls it was found that the serum bilirubin levels which includes total bilirubin, direct bilirubin and indirect bilirubin was found to be lower among the case group compared to the control group and this difference was found to be statistically significant (p <0.05). A perfect linear correlation between the ejection fraction and serum bilirubin levels, as the ejection fraction decreases the serum bilirubin levels was also decreasing.Conclusions: This study showed a significant association between the reduced serum bilirubin levels and the occurrence of CAD; therefore, bilirubin level can serve as a predictive factor, together with other influential factors for identifying a person at risk of developing coronary artery disease. Abstract: Background: Atrial fibrillation (AF) is the most common sustained disorder of cardiac rhythm. To study the epidemiology, demography and clinicoetiological profile of nonvalvular atrial fibrillation, such studies are sparse in India.Methods: One hundred sixty-five patients of nonvalvular atrial fibrillation were enrolled prospectively in the study during the period February 2017 to May 2018. Patients with an electrocardiographic documentation of atrial fibrillation, either chronic or paroxysmal were enrolled in the study. Patients underwent thorough physical examination, routine laboratory testing, and other relevant investigations to assess the underlying etiology. Baseline characteristics of all the patients’ viz. type of AF, primary etiological diagnosis, and baseline clinical parameters were noted. Statistical analysis was done using percentage analysis.Results: A total of 165 patients were enrolled in the study. The vast majority of patients were elderly; with the majority being in the 56-65years age group (45.45%). AF was more common in men (56.3%). Systemic hypertension was the most common etiological association (80%).Conclusions: Present study found that advanced age and male gender are significant risk factors for AF. Systemic hypertension is the most common etiological association with nonvalvular AF. Authors conclude that for grading and staging of the pancreatitis of acute nature, CT scan is must and is very helpful to the clinicians. CT scan helps not only in precise diagnosis but also in predicting the proper prognosis of the patients who are affected by the pancreatitis of acute in nature. Abstract: Background: Diabetic foot ulcers (DFU) are a common, costly, complex, and disabling complication of diabetes resulting in lower-extremity amputations. Diabetes Mellitus (DM) is associated with an increase in the incidence of peripheral vascular disease (PVD) compared to non-diabetic subjects. DFU are divided into two types: neuropathic ulcers (NPU) and neuro-ischemic ulcers (NIU). PVD in association with neuropathy leads to neuro-ischemic ulcers (NIU).Methods: A cross-sectional observational study was conducted for eighteen months period from October 2016 to March 2018, on 120 type-2 DM patients presenting with DFU at tertiary centre in central India. Informed written consent, detailed history was obtained from the patients including duration of diabetes, history of hypertension, smoking, presenting symptoms and other complications related to diabetes. Examination of foot and evaluation for peripheral pulses, ankle brachial pressure index (ABI), neuropathy and blood pressure were done. Laboratory tests for HbA1C, lipid profile, blood urea, serum creatinine and urine albumin creatine ratio (urine ACR) were done. Statistical analysis used: t test, fisher exact test and univariate analysis.Results: In our study, 1594 patients with T2DM were studied, out of which 120 patients presented with new DFU. Mean age of the patients was 61.5years with an M: F ratio of 1.78:1. NIU was present in 36 and NPU in 84 out of 120 DFU patients. Neuro-ischemic ulcers (NIU) were more common among males (28/78 males vs 8/42 females). NIU was found to have significant association with smoking (25/36 patients), hypertension (28/38 patients) and longer duration of diabetes (13.1 vs 9.2years). Other diabetic complications, retinopathy (26/36 patients) and nephropathy (18/36 patients) were more prevalent in patients with NIU. Dyslipidemia was also found in 58.33% (21/36) patients with NIU however the association was insignificant.Conclusions: Diabetic foot ulcers are very debilitating complication of diabetes, and a leading cause of amputations all over the world. Because of increased association of peripheral vascular disease with diabetic foot ulcers there is a rise in prevalence of neuro-ischaemic ulcers. Early management of peripheral vascular disease is important to prevent development of neuro-ischaemic ulcers. Authors: Nilesh S. Sonawane, Sanjay M. Gour, Radha P. Munje, Vandana P. B. Authors conducted a cross sectional study among the patients of allergic rhinitis presented to us in our outpatient department from January 2016 to July 2017. The patient’s with allergic rhinitis either newly diagnosed or already on treatment were included in the study. Standard guidelines as given by ARIA were followed in defining a case of allergic rhinitis. The detailed clinical history was taken, and examination was performed of all the patients and documented. Spirometric evaluation was done using the standard guidelines by a desktop based Spirometry.Results: The mean age of the study subjects was 30.22±13.13 years with male: female ratio of 0.96. The mean duration of the allergic rhinitis in our study was 3.86±3.34years. The most common complaint was itching sensation of nose followed by paroxysmal sneezing and watering of eyes. About 22.15% of the study subjects have impaired Spirometry. Upon bronchodilator therapy 30% of the study subjects had significant reversibility in FEV1.Conclusions: About ¼ of present study subjects had impaired Spirometry and about 30% of them had reversibility after bronchodilator therapy. Authors also found that the higher age study subjects had significantly higher impaired Spirometry; persistent allergic rhinitis patients had higher impairment of Spirometry and the patients with higher the sputum eosinophilia had higher impairment in Spirometry. Authors: Mohammed Aslam Shaikh, Bhanuprakash P.
Abstract: Background: Metabolic syndrome is a clustering of risk factors that increase an individual’s probability of developing atherosclerotic cardiovascular disease, type 2 diabetes mellitus and all cause mortality. Since primary NAFLD has strong association with metabolic syndrome as a whole and various components of metabolic syndrome, it is being debated whether NAFLD is a hepatic component of metabolic syndrome. Hence this study was done to study the prevalence of non-alcoholic fatty liver disease in healthy individuals and in patients with metabolic syndrome and to establish a relationship between NAFLD and Metabolic syndrome.Methods: A total of 122 patients - 61 with metabolic syndrome and 61 without metabolic syndrome fulfilling inclusion and exclusion criteria who presented to the Medicine outpatient Department of Ramaiah Medical College, Bangalore, between October 2014 and September 2016 were included in the study. Baseline variables, laboratory parameters, ultrasound abdomen findings were compared between the groups.Results: Mean age of the subjects in metabolic syndrome group and non-metabolic syndrome group were 52.4±15.4 and 50.7±15.4years respectively. Mean triceps skin fold thickness (in cms) for the subjects in metabolic syndrome group and non-metabolic syndrome group were 19.16±6.1 and 7.59±2.57 respectively (P <0.05). Prevalence of fatty liver on ultrasonography in metabolic syndrome and non-metabolic syndrome were 42.62 % and 21.31% respectively. Overall prevalence of NAFLD was 31.97 %.Conclusions: Overall prevalence of NAFLD from current study was 31.97%. The prevalence of NAFLD was significantly higher in persons with metabolic syndrome than persons without metabolic syndrome. Abstract: Background: Chronic kidney disease (CKD) is a major health deteriorating factor worldwide as well as in India. It encompasses various pathophysiological processes involving abnormal kidney function and thereby declination in glomerular filtration rate (GFR). CKD is known risk factor for dyslipidemia. Due to lack of studies of association between different lipid parameters and its association with severity of CKD in non-diabetic patients in Indian population, we designed a study aimed to describe the serum lipid profile in non-diabetic CKD patients.Methods: This hospital based observational analytical was carried out in 60 subjects with CKD and non-diabetic. They were investigated for blood sugar parameters, lipid profile and renal function tests. Lipid profile was associated with different stages of CKD. Data was expressed as percentage and mean±SD.Results: Mean BMI was found to be 21.6±2.7kg/m2. Most common symptom encountered was H/o edema in 98% subjects. Out of total sixty subjects’ maximum subjects were found to be in stage 4 (22 subjects, 36.7%). Significantly higher levels of serum creatinine (p <0.0001), and serum urea (p <0.0001) was observed in higher grade CKD stages in study subjects.Conclusions: Total cholesterol (TC) and LDL were found to be significantly different amongst CKD stages having higher mean values in non-diabetic subjects. Serum TC, TG, LDL and VLDL were found to be significantly higher in subjects with advanced CKD (stage 3, stage 4). TC/HDL and LDL/HDL ratio were significantly higher in subjects with advanced CKD compared to initial stages of CKD in non-diabetic subjects. Abstract: Background: The interaction of obstructive sleep apnoea (OSA) with vascular risk factors is known as syndrome Z which is also known as the metabolic syndrome or the insulin resistance syndrome and these include the hypertension, central obesity, insulin resistance and hyperlipidaemia. The objective of the present study was to investigate the prevalence and severity of syndrome Z at tertiary care center.Methods: This prospective study was conducted among 40 eligible patients between May and July 2018 at the tertiary care center included adult patients >18years of age. Overnight fasting glucose and lipid levels were measured, and baseline anthropometric data recorded. All sleep studies were scored and reported by a sleep physician. OSA was deemed to be present if the respiratory disturbance index (RDI) was >5, with mild, moderate and severe categories classified according to the Chicago criteria.Results: Mean age of participants was 52.7years, 77.5% were male, Mean BMI and waist circumference were 29.2kg/m2 and 113.8cm respectively. Almost 92.5% participants were known case of HTN, 85.0% were DM and 67.5% Dyslipidemia. Around 60.0% participants were belonged to severe grade of OSAS and 7 (17.5%) patients who fulfilled all five criteria for the diagnosis of the metabolic syndrome had severe OSAS. The prevalence of OSA in the entire group was 95.0%.Conclusions: The prevalence of syndrome Z in present study participants was very high. With the help of history and polysomnogram, metabolic syndrome should be screened for OSA. Early diagnosis and treatment of OSA is the essential part in the treatment of metabolic syndrome and hence CAD. Abstract: Background: By 2025, India due to its immense population size and high diabetes prevalence will contribute about 57 million diabetics. Hence the aim of the present study was clinical presentations of diabetes in children attending the paediatric ward in the medical institute.Methods: Total of 50 cases were included in the study. All the children who were less than age of 18years and also diagnosed with diabetes that is fasting blood sugar >126mg/dl or random blood sugar level > 200 mg/dl were included in the study. A detailed clinical examination of the child was carried out with detailed anthropometric measurements. Metabolic profile was done by investigating for the following. Fasting blood sugar, post prandial blood sugar, glycoslated haemoglobin.Results: The various ranges of fasting blood sugar were as follows: 25% were in the range of 130-200mg/dl, 35% in 200-300 mg/dl, 25% in 300-400mg/dl and 15% had more than 400 mg/dl fasting blood sugar levels. The various ranges of post prandial blood sugar were as follows: 16% were in the range of 200 - 300mg/dl, 40% in 300-400mg/dl, 44% had more than 400 mg/dl post prandial blood sugar levels. In the present study lipid profile of all the children was analysed by their serum cholesterol and triglycerides.Conclusions: A total of 50 diabetic children of age less than 18 years attending medical Hospital were studied using a predesigned and pretested proforma. Information was collected on socio-demographic, dietary intake, treatment and compliance history. Detailed clinical examination done and anthropometric measurements were taken. Metabolic profile was done by investigating for blood sugar levels, glycoslated haemoglobin and lipid profile. In the present study 46% had onset of diabetes mellitus at 15 to 18 years age group with male to female ratio of 1.26:1. Abstract: Background: MRI has the unique ability to show both structure and function objectively without any radiation exposure to the patient. Apparent diffusion coefficient (ADC) is a quantitative parameter that combines the effects of capillary perfusion and water diffusion. Renal parameters have shown inverse relationship with the ADC values in these studies. So, ADC values have a potential to serve as a marker of renal function. The aim of the present endeavor was to study the role of DW MRI in characterization of renal function and to find out the clinical use of DW MRI in renal diseases; and establish the relationship between renal function assessed by eGFR and that by DW MRI calculated in terms of ADC values in various renal diseasesMethods: Total 30 patients were included in the study. The study was carried out in department of radiodiagnosis at Dr. RPMGC Kangra. 1.5 Tesla MRI machine was used. The ADC value was calculated at upper, mid and lower pole of each kidney and the mean was taken. Then the mean of right and left kidneys was taken to calculate the mean ADC of the patient.Results: Serum creatinine in present study ranged from 0.67 to 13.9mg/dl, with mean value of 7.28mg/d. Serum urea ranged from 22 to 293mg/dl with the mean of 119.6mg/dl. There was significant inverse correlation occurred between ADC values and serum urea (r=-0.43, p=0.02). There was significant inverse correlation between ADC values and serum creatinine (p=0.01) and a positive correlation between eGFR and ADC values (r=0.14, p=0.47).Conclusions: ADC values consistently decreased with increasing stage of renal failure, so these can be used as an indirect maker of renal function. Authors conclude that lower would be the ADC value more advanced would be the stage of renal failure. DW MRI can also be detect early stages of renal failure even when the serum maker are within normal range. Authors: Debasish Sahoo, Purabi Baral, Soumya Ranjan Mahapatra, Anshuman Sarangi, Kiran Babu K. K.
Abstract: Background: HIV presently accounts for the highest number of deaths attributable to any single infective agent. Opportunistic infections (OIs) and associated complications account for a considerable proportion of such mortality. Diarrhoea is among the most common symptom of HIV infection. During the natural course of HIV infection, there is a progressive loss of CD4 T cells. Autors’ aim is to study the prevalence of enteric pathogens in HIV patients with chronic diarrhea and their relationship with CD4 count.Methods: We analysed 186 HIV positive patients out of which 126 had chronic diarrhea and 60 patients presenting without diarrhea as controls. The faecal samples were subjected to microscopic examination. Zeihl Neelson’s Stain for mycobacterium, Kinyoun’s acid fast stain for microsporodia, stool culture for salmonella and shigella. All patients had barium meal contrast studies, USG of abdomen and pelvis. FNAC of peripheral lymph nodes and finally CD4+ Tcell count using BD FACS.Results: Total of 68,10,01 patients of HIV diarrhoea with identifiable cause had CD4 <200, 200-250 and >350 respectively. Among HIV diarrhoea without any identifiable cause 22, 17, 08 patients had CD 4 <200, 200-250 and >350 respectively. All diarrhoeal stool samples with Isopora had CD 4 <200, M. tuberculosis 26 patients CD4 <200, 12 had 200-350 and 03 had >350. Microsporodium 03 patients had CD4 >350. Finally, among stool samples with Cyclospora, E. histolytica, Giardia and Strongyloides all patients had CD 4<200.Conclusions: The present study highlights the importance of testing intestinal pathogens in HIV. Chronic diarrhoea was more common in patients with low CD4 counts. Abstract: Background: Critical amount of urinary albumin excretion has long been reported to be one strong predictor of cardiovascular events in hypertensive patients. Very few studies have been conducted till now depicting correlation of microalbuminuria and target organ damage in patients with essential hypertension, except cardiovascular events. We evaluated the prevalence of microalbuminuria in patients with essential hypertension and its relationship with target organ damage.Methods: Total 120 patients of essential hypertension were studied. Prevalence of urinary albumin excretion and its correlation to target organ damage (left ventricular hypertrophy, retinopathy and stroke) was analysed. Urinary albumin excretion was assessed by turbidimetry method and microalbuminuria was assessed by urine albumin to creatinine ratio.Results: Microalbuminuria was found to be present in 57.7% patients. Target organ damage was observed in 62.5% (75) patients, out of which 78.66% patients had associated microalbuminuria (p <0.05). Amongst them, higher prevalence was observed in patients with longer duration and greater severity of hypertension, increased body mass index and dyslipidemia.Conclusions: Microalbuminuria assessment in hypertensive patients is an important test for the evaluation of target organ damage. Optimal management of hypertension, weight control, and maintenance of normal lipid levels leads to decreased risk of microalbuminuria. Abstract: Background: Metabolic syndrome and its individual criteria pose a risk for atherosclerosis and cardiovascular disease (CVD). Carotid intima media thickness (CIMT) is a well-known marker of subclinical atherosclerosis. This study was aimed to assess CIMT in patients with metabolic syndrome.Methods: This one year cross-sectional study was conducted in the Department of Medicine, KLES Dr. Prabhakar Kore Hospital and Medical Research Centre, Belagavi from January 2016 to December 2016. A total of 100 patients diagnosed to have metabolic syndrome based on national cholesterol education program adult treatment panel III (NCEP ATP III) criteria were studied. All the patients were subjected to carotid B mode ultrasonography.Results: The most common age group was 51 to 60years (29%). Out of 100 individuals who were diagnosed to have metabolic syndrome, 60% had five criteria, 29% had four criteria and 3% had three criteria. Most of the of the individuals (61.00%) had normal (≤0.10cms) CIMT while high (>0.10cm) levels were noted in 39.00% of the individuals. The mean CIMT was noted as 0.13±0.16cms. The mean SBP (150.15±10.39 vs 142.98±20.09mmHg; p=0.042), DBP (94.51±6.53 vs 90.16±9.91 mmHg; p=0.017), total cholesterol levels (243.53±65.74 vs 195.95±29.8 mg/dL; p<0.001) and triglyceride levels (221.07±48.44 vs 180.85±24.74mg/dL; p <0.001) were noted in individuals with raised CIMT compared to individuals with normal CIMT. Majority of the individuals had abnormal HDL (93.00%) and 41.94% of the individuals with abnormal HDL had raised CIMT (p=0.027).Conclusions: Some individuals with metabolic syndrome are likely to have raised CIMT. The rise in CIMT among the patients with metabolic syndrome is associated with raised SBP, DBP, abnormal HDL (specifically in males), total cholesterol and triglycerides. Abstract: Background: Poisoning is the most common method, employed for the act of deliberate self-harm. The wide availability, lack of rules and regulations for the sale of pesticides resulted in wide spread use of Organophosphate as one of the most common poison used for deliberate self-harm.Methods: In this study, authors aim to find out clinical profile with respect to different O.P. compounds, prognosis and outcome of each patient in relation to the delay in getting medical attention. Present study objective is to find out if there is any specific clinical finding which can predict bad outcome.Results: Out of 344 cases, 189 cases had type 1 respiratory failure, while in 34 cases type II respiratory failure present. 61 cases expired and out of these 61 cases 47 cases died within 24 hours and 11 cases died in next 48 hours.Conclusions: Maximum number of cases were in the age group of 21 - 30years. The maximum number of deaths were in the first 72 hours. Number of cases were more in males as compared to females. Chances of survival was better in persons who reached early to the hospital. Abstract: Background: Irritable bowel syndrome (IBS) is a functional disorder of gastrointestinal tract with unclear aetiology and no reliable biomarkers like other chronic and functional disorders. Majority of the patients of IBS suffer from various forms of psychosomatic disorders as comorbidity that further exaggerate the complexity of diagnosis and management of IBS. The aim of the present study was to find the prevalence of commonly associated psychosomatic symptoms associated with IBS in the patients of lower socioeconomic strata.Methods: This is a prospective observational study carried out over a period of 10years from November-2007 till October-2017, in HAHC hospital attached to Hamdard Institute of Medical Sciences and Research. A structured questionnaire comprising of a total of 36 closed ended questions was designed. Eleven questions were about the demographic characteristics and twenty-five were pertaining to IBS symptoms according to Manning and Rome III criteria with some necessary modifications. Various psychosomatic illnesses were recorded separately after ruling out the organic cause with appropriate investigations.Results: In the present study out of 4000 patients with IBS symptoms, 70.8% were having some form of psychosomatic symptoms, Patients with psychosomatic disorders were significantly more often young in age and females (53.28%), showing highest number of patients belonging to the age group 26-35years (51.44%). 34% patient had two or more psychosomatic illnesses. Headache (62.26%) and insomnia (63.03%) were the commonest followed by chest pain (36.54%). Chest pain (77.68%), headache (62.26%) and insomnia (56.07%) was more common in male whereas palpitation (60.58%) and breathlessness (57.68%) was more common in female.Conclusions: There is significantly high prevalence of psychosomatic illness in the patients of IBS in the low socio-economic strata. The young patients (productive age group) are more affected which may be responsible for further deteriorating their social and economic condition. Abstract: Background: Liver plays an important role in regulation of blood glucose in fed state as well as in fasting. Diabetes mellitus can result as a consequence of liver disorder and vice versa. Objective of the present study is to compare the liver enzymes in type 2 diabetic patients as compared to non-diabetic patients.Methods: A case- control study was conducted in Clinical Biochemistry Laboratory, Adarsha Super speciality Hospital, Udupi from April 2018 to August 2018. The data of 174 diabetic patients and 118 healthy people as controls was collected. Fasting blood glucose, aspartate aminotransferase (AST), alanine amino transferase (ALT) and alkaline phosphatase (ALP) were estimated in the study subjects.Results: It was found that AST levels (47.55±4.69U/L) in diabetics extremely significantly high as compared to controls (33.51±2.33U/L). ALT levels were insignificantly high in diabetics compared to controls. ALP was significantly elevated (p=0.0002) in diabetics. Correlation study showed a weak positive correlation between AST, ALT and blood glucose. Odds ratio showed a higher risk of liver enzyme elevation in diabetics. Risk of elevation of AST was found to be 1.65 times high and ALT was 1.25 times high in diabetics compared to non-diabetics.Conclusions: Diabetics had high liver enzymes as compared to non-diabetics. An association was found between type 2 diabetes mellitus and liver enzymes. For better characterization of cause and effect, further studies need to be done on alterations in liver function tests along with the histopathological analysis of liver biopsy samples. Abstract: Dengue infection related ocular pathology whether as a direct manifestation of coagulopathy or as a sequale of immunological reaction is being increasingly recognized in endemic regions and has expanded out into a spectrum with pan ocular presentation. Authors present a case of a young female from an endemic region who developed visual field abnormality and loss of vision several days after onset of fever. She was diagnosed with dengue virus infection and subsequently went on to develop thrombocytopenia requiring transfusion. Detailed ophthalmological evaluation revealed maculae edema, and changes consistent with neuroretinitis and posterior segment vasculitis. She was treated with a combination of pulse steroid therapy and intravitreal dexamethasone injection. Patient went on to have excellent visual recovery on follow up with no persisting visual field deficit. Abstract: Efavirenz is the first line non-nucleoside reverse transcriptase inhibitor suggested by World Health Organization for newly diagnosed patients started on antiretroviral therapy. Dermatologic manifestations are the usual side effects associated with this drug. Authors hereby, present a case report of efavirenz induced drug hypersensitivity reported at a tertiary care hospital at Allahabad, Uttar Pradesh. The patient developed rashes and vomiting within a week of start of TLE regimen. Re-challenge test revealed confirmation of the adverse drug reaction by efavirenz. Change of the regimen was done for the patient following hospitalization for the event. This case report explains that strict pharmacovigilance is essential in the initial days of start of antiretroviral therapy. Further trials to improve the safety profile of the patients on ART are the need of the hour. Authors: Baishakhi Chandra, Bhaskar K., Paramjyothi G. K.
Abstract: Pulmonary hypoplasia is a bronchopulmonary foregut anomaly in which gross morphology of the lung is preserved but there is decrease in the number or size of airways, vessels, and alveoli. Unilateral pulmonary hypoplasia is a rare clinical condition and most patients reported in the literature are newborns and infants, but patients may remain asymptomatic until late adolescent or till adulthood 65 years old male with parkinsonism was referred to our department with complaints of recent chest symptoms. Clinical examination revealed loss of lung volume in left hemithorax. CT scan thorax and bronchoscopy confirmed the diagnosis of left sided pulmonary hypoplasia. This case report highlights the possibility of pulmonary hypoplasia as one of the differential diagnoses in adult patients presenting with loss of lung volume and to the best of our knowledge he is the eldest patient so far reported.